There were big changes in store for the dazzling 2014 Toyota Corolla, and although we knew the new design looked sweet, time behind the wheel would give us a true measure of the car. That was taken care of when we drove the Corolla for a week, and quite honestly, we hated to see the week end. You’ll find yourself doing a double take when you first see the Corolla, because the new design is light years ahead of the past models with the new aggressive styling. 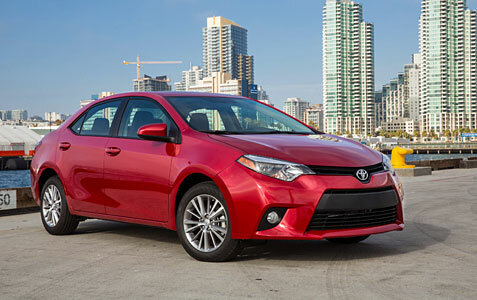 The 2014 Toyota Corolla S Premium looks that good and will shake the compact car segment without a doubt. Our test model was a sharp blue crush metallic sporting 17 -nch smoked alloy wheels. The all-new Corolla makes an immediate visual impact with a more expressive, chiseled exterior design that elaborates on the “Iconic Dynamism” theme first seen on the Corolla Furia Concept that debuted at the North American International Auto Show. The new Corolla is distinguished by its tauter, more athletic proportions that ride on a longer wheelbase (+ 3.93 inches/ +100 mm compared to current model). With the wheels pushed out toward the corners, compact overhangs, and more tapered front and rear expression, the new Corolla communicates a more dynamic compact sedan form, even at a standstill. The new sedan is 3.90 inches (99 mm) longer overall and yet presents a more compact appearance than the current model thanks to a basic shape that tapers at the front and rear of the vehicle to help emphasize the wheel arches and wheels-to-the-corner stance. The new Corolla features an expressive front fascia with sharper, more pronounced details above a large trapezoidal grill that rests beneath a thin intake inlet below the hood. The front view of the new Corolla reveals a continuation of the design themes seen in recent Toyota sedans such as Camry and Avalon, and it creates a sleeker, more assertive impression of a Toyota compact sedan with its more precisely sculpted surfaces. Among the challenges presented by the new Corolla’s original design concept was the need to execute more deeply rounder corners to achieve the desired sleeker image. The thick structure of conventional headlamps would hinder the appearance of deeply rounded corners. Sleek, compact LED lamp assemblies were adopted to reduce the corner mass and help accentuate the Corolla’s tapered, rounded-corner, front- end design theme. In addition, the low heat generated by the LED lamp enabled the use of a lighter weight PES resin lens instead of conventional glass. Corolla is the first compact sedan to offer standard equipped LED headlamps. 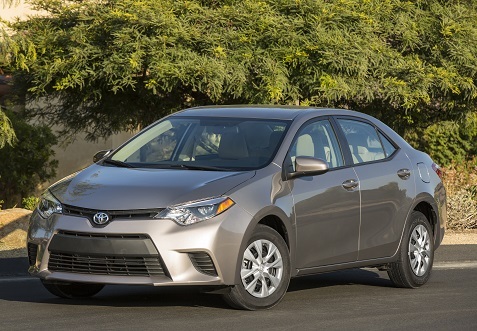 The impressive 2014 Toyota Corolla S Premium continued inside the cabin with a plethora of new options that enhance the overall driving experience. The new Corolla’s interior continues the “Iconic Dynamism” theme to create a stylish, highly functional and inviting interior space with a greater sense of craftsmanship in its design, use of materials and attention to detail. A horizontally oriented dash structure helps enhance the interior’s sense of spaciousness while providing a more wide-open, intuitively functional space for interface with vehicle controls. The interior offers a premium aesthetic with its use of piano-black gloss trim highlighted by metallic ornamentation and trim that conveys an upscale yet sportier image. Depending on interior color theme, blue, black or amber pinstriped accents are used in conjunction with the dash and door panel ornamentation to enhance the premium appeal of the interior. Ornamental stitching along the leading edge of the dash pad adds a sense of craftsmanship to the interior’s upscale nature. An available decorative boot with ornamental stitching surrounding the shift lever adds a sporty, premium look.